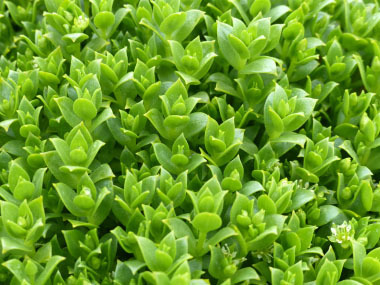 Sea sandwort is a succulent perennial edible plant with creeping stolons that make it well adapted to growing in mobile substrates. It is a subdioecious plant; which means that some flowers produce seeds but no pollen, while others produce mostly pollen but also a few seeds. This plant was named after German botanist Gerhard August Honckeny (1724–1805). 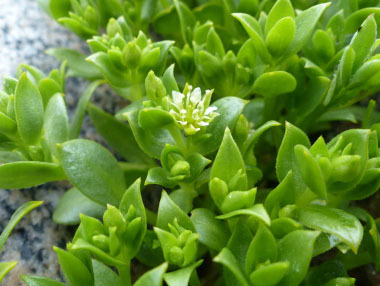 Sea sandwort stabilizes and fertilizes the substrate it grows on, thereby helping other maritime plants. Over time it changes the conditions in a way that they meet the other plants’ demands and eventually finds itself in retreat from the increasing competition. It is in the Caryophyllaceae family. 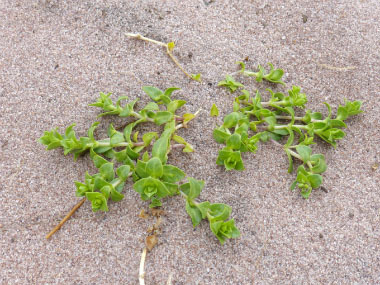 Distinguishing Features: This seaside plant forms distinctive mats or clumps on sandy locations and in areas in which there are masses of sea shells and rocks. It is easily recognizable with its neatly arranged, pointed leaves in opposite pairs closely behind each other up the creeping stems. Its white petalled flowers are held singly above the leaves, the petals being slightly shorter than the sepals. 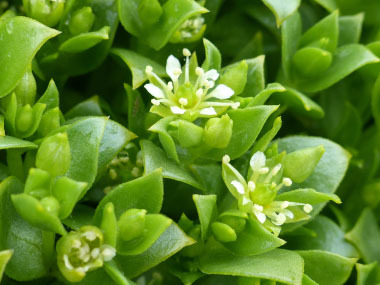 Flowers: Sea sandwort flowers are radially symmetrical, white, and 6 to 10 mm (.24 to .4”) broad. Each pistillate (female) flower has five petals. The staminate (male) flower is 3.5 to 6 mm (.14 to .24“) long, pistillate flower is 1.5 to 4 mm (.06 to .16”) long. 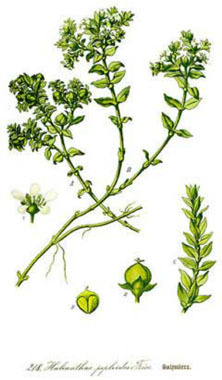 (Often there are pistillate and staminate flowers on different plants.) It has several stamens and five sepals. Inflorescence is a 1 to 6-flowered terminal cyme, solitary flowers axillary. The flower blooms between June and August. 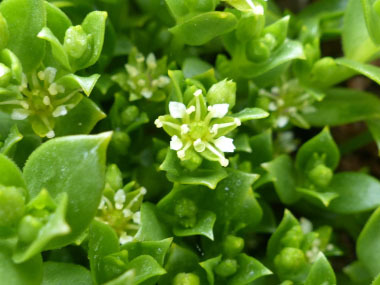 Fields of Nutrition has medicinal benefits and vitamin/mineral content of Sea Sandwort. 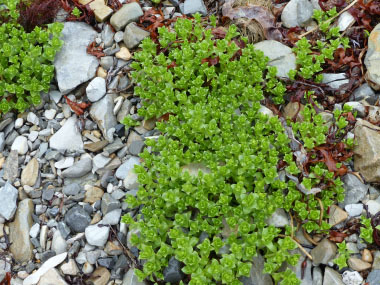 Leaves: Sea sandwort leaves appear opposite, and they have no petiole. The blade is ovate to elliptic, tapered, with entire margins, glabrous, and fleshy. The leaves are a dark-lime green colour. Height: This plant grows anywhere between 5 and 15 cm (2 to 6“) tall. Runners are up to 30 cm (12”) long. The stem is fleshy and this plant forms mat-like stands. 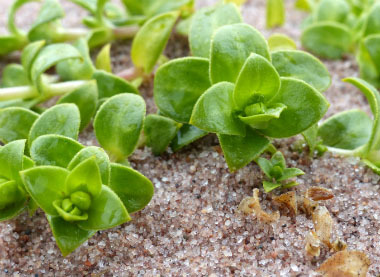 Habitat: Sea sandwort grows in sandy, stony areas by seashores. It grows on rocky and shingly shores, and winds through cracks between rocks. It also can be found growing through piles of small sea shells as well. Although this is commonly located in coastal regions in the northern hemisphere, there are unconfirmed reports of it being found on the south island of New Zealand as well as in Indonesia. 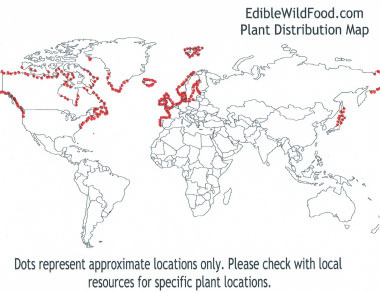 Edible parts: Young shoots raw or cooked are edible. They have high levels of vitamins A and C. They are maximum for nutrition before they flower although still edible after blooming. In Iceland the plant is steeped in sour whey and fermented. Seeds can be used in baking or as a garnish although they are so tiny they are very difficult to harvest.